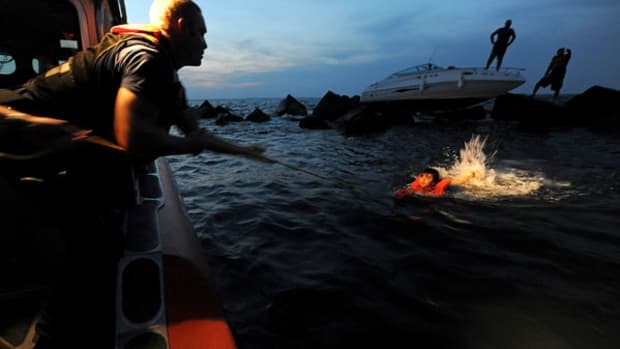 When people fall overboard, more often than not it’s at the marina when stepping on or off the boat. They slip or trip and end up in the water. The surprised swimmer is usually unharmed, except perhaps for a damaged ego, and is quickly recovered and made fun of. Fall off a vessel that’s underway, however, and everyone quits laughing. 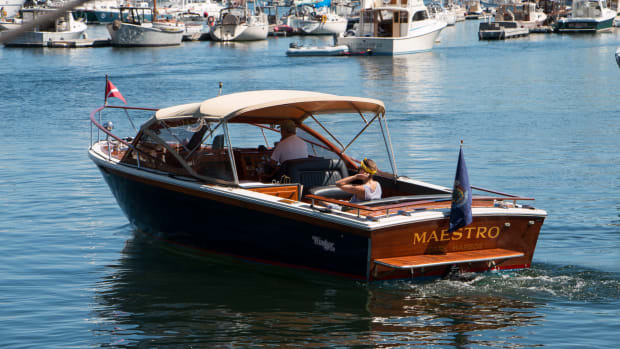 The most dangerous part of boating is unexpectedly falling overboard. How dangerous? If those left aboard lose sight of you, there is a 40 percent chance you will never be seen again — dead or alive. I’m not trying to take the fun out of boating, but when to wear a life jacket and what to carry in its pockets is the most important discussion I’ve had with boaters. After a lifetime of looking for PIWs (persons in the water) and usually coming back empty, I’ve developed some rules about life jackets and their use. 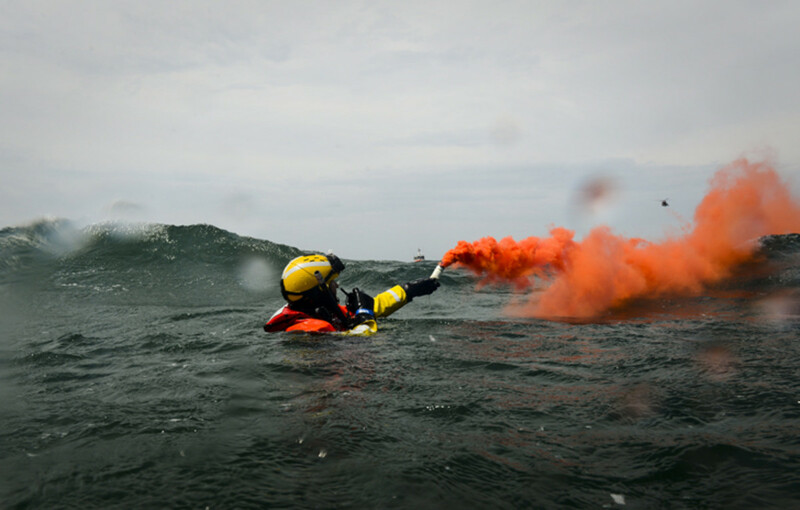 If you follow them, your chances of being rescued go way up. Life jackets have pockets for a reason, and it’s not to carry snacks. The best jackets have loops of webbing or tabs inside the pockets for tying in gear (I’ll come back to that). 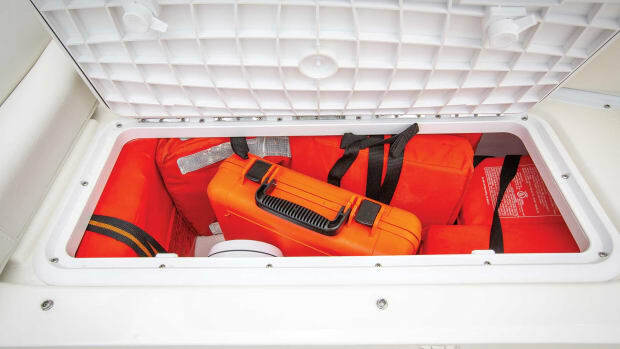 The idea is that if you don’t carry signaling gear and other survival tools in your life jacket, you won’t have them if you fall overboard. If your current PFD doesn’t have pockets (this is true of many inflatables), you can often buy them to attach to the webbing belt. If you can’t, you’ve got the wrong device. Get a new one. 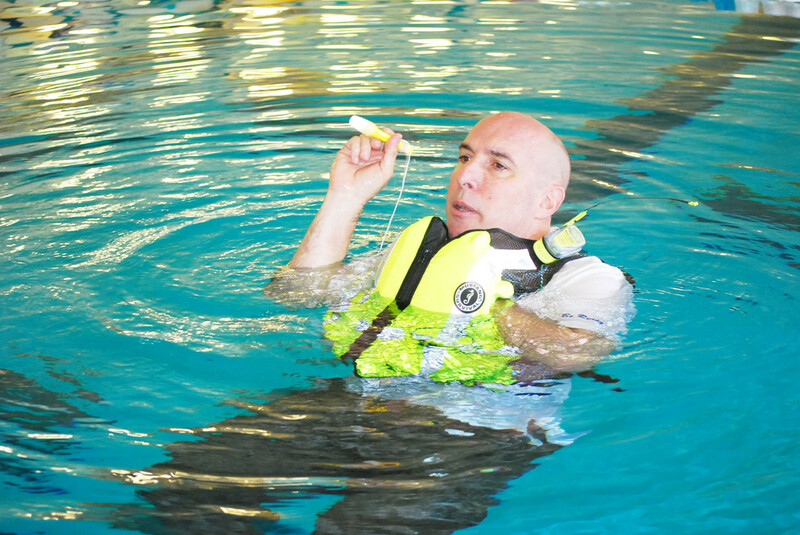 Vittone tests life jackets in South Florida. 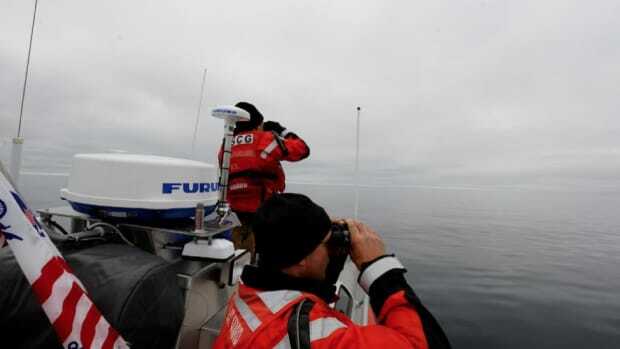 I’m often asked, “What is the one thing you should always carry with you?” My first reaction is to say a life jacket with more than one thing, but if I had to pick one it would be a personal locator beacon, set up and registered correctly (tune in next week for how to do that). I know, PLBs cost more than most life jackets, but if you ever have to activate it while alone in the water, you’ll think it’s the best money you ever spent. · Lights: It’s best to have a water-activated strobe attached to the upper shoulder of your vest, though keeping one in a pocket is better than not having one. 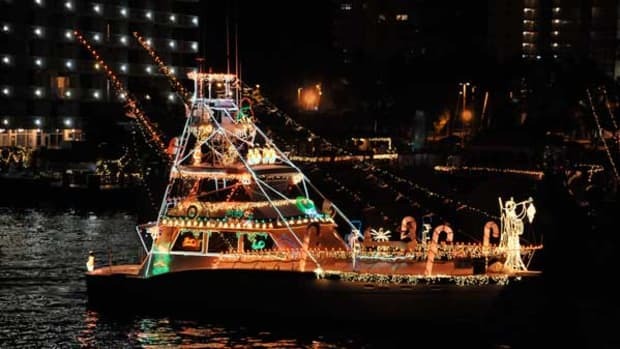 At a minimum, stuff a few 12-hour chemical lights in the PFD. · Signal mirror: It may seem like a last-chance survival device, but a mirror is lightweight, inexpensive and small, and it has unlimited range and never runs out of battery power. Like whistles, a mirror falls into the no-good-reason-not-to-carry-one category. Coast Guard-approved mirrors are too big (4 by 5 inches, on average) to fit into most pockets, but the sun doesn’t know the difference when it reflects off a smaller one. · Waterproof flashlight: This is my favorite. I carry two. Nothing turns a helicopter around like a waving flashlight. 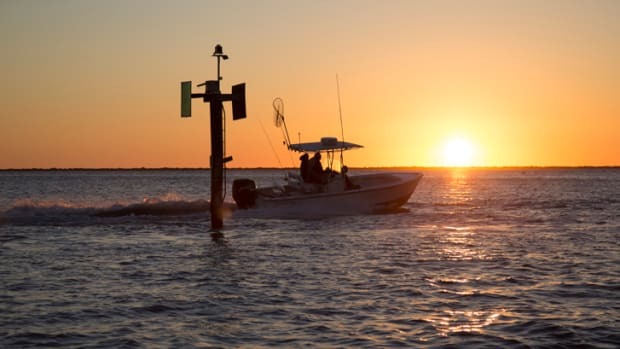 Strobe lights have a range of about 3.5 to 4 miles, but the focused beam of a strong flashlight can reach almost anything on or above the water. 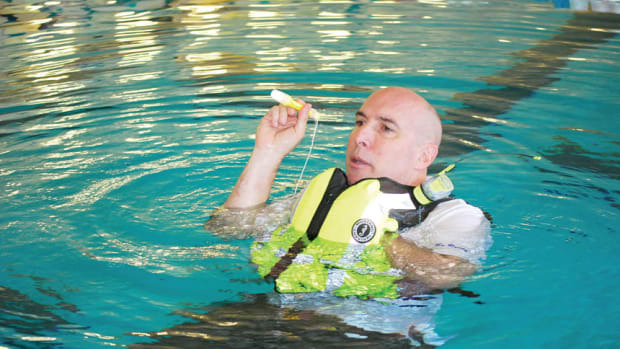 Vittone teaches the proper use and setup of life jackets and signaling devices. You will be opening pockets that are under the water, and you might be working in the dark. The gear must be tied into or onto the vest. If you drop something, it’s gone. The Coast Guard had us tie our gear in with 36-inch lengths of nylon cord. It always served me well and seemed like the correct length. Devices such as strobes and PLBs must be securely attached as high above the water as possible. You won’t be able to hold to either device for long, and just because some beacons float doesn’t mean they work well when floating. The antenna must be high to effectively transmit a signal. 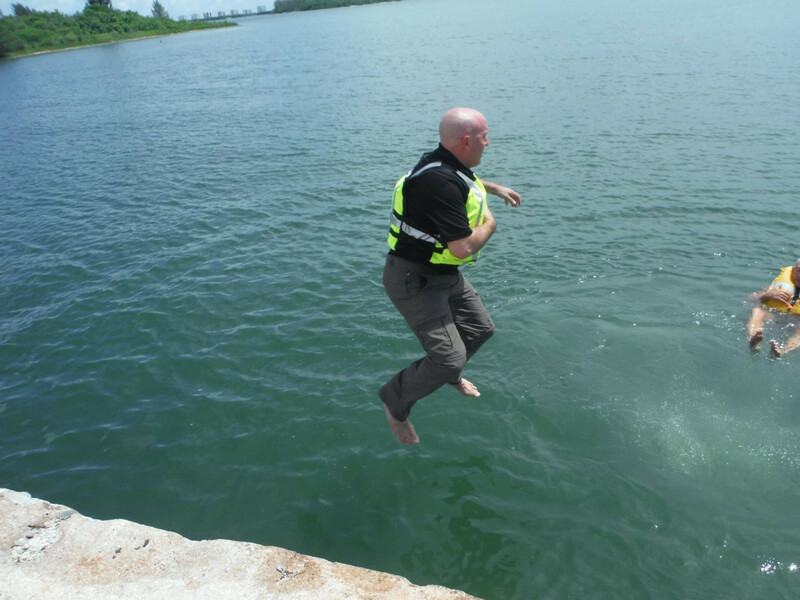 Of course, none of this will help if you aren&apos;t wearing a life jacket when you go over. Next week, I&apos;ll discuss when you should wear your life jacket — and why it isn&apos;t “always” — as well as the pros and cons of inflatables and fixed flotation. Going overboard is the most dangerous part of boating. Choose your life jacket and set it up as if you knew you were about to fall overboard. Plan on it. The gear you leave on the boat won’t be of any help once you’re in the water.